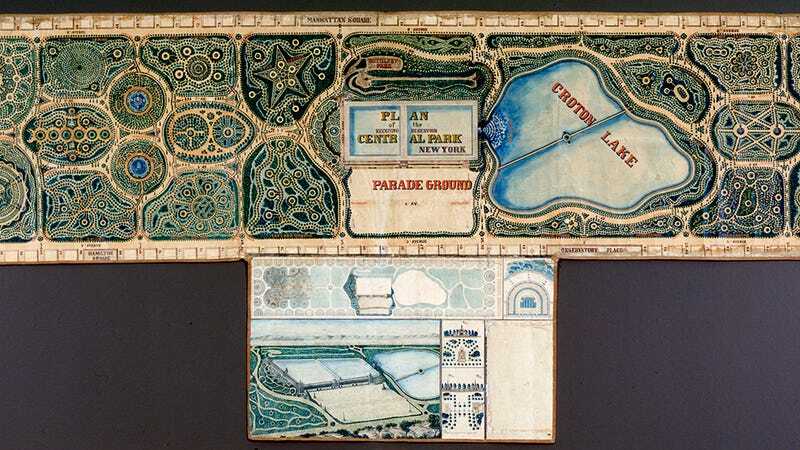 When the Board of Commissioners of Central Park decided it was time to build Central Park in 1857, they announced a design contest with a prize to the tune of $2,000 (around $50,000 today). Obviously, it was Frederick Law Olmsted and Calvert Vaux's design won. But there were 33 other failed entries, only five of which still exist. One of those is from engineer John Rink. It's currently on display at the New-York Historical Society, though it was believed to be lost until 2008, when it as discovered in an attic. The design features a series of highly planned park areas that look like biological illustrations of sea creatures, a la Ernst Haeckel. From above, it looks like one giant garden maze, intricately dotted with tons of topiaries, drawing heavily on Victorian garden design.